It seems like forever since I reviewed a new comic, much less read a new batman comic. It seems like I only show up in Gotham when something big is happening. However, this issue caught my eye because it’s an Amanda Conner one. 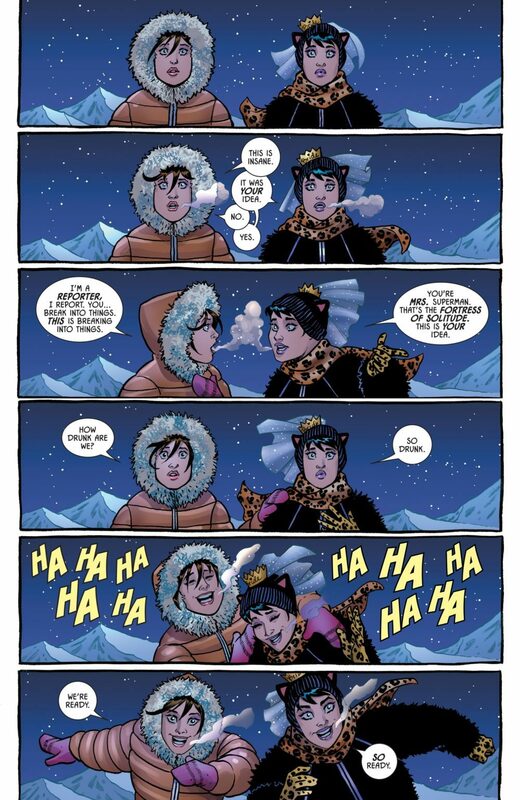 The preview pages had the feeling that Tom King was giving her a script that suited her talents and were much like the work that she and her husband Jimmy Palmiotti have come to be known for. While I like the creators behind this issue, I really dislike the way Batman has been treated in recent years. 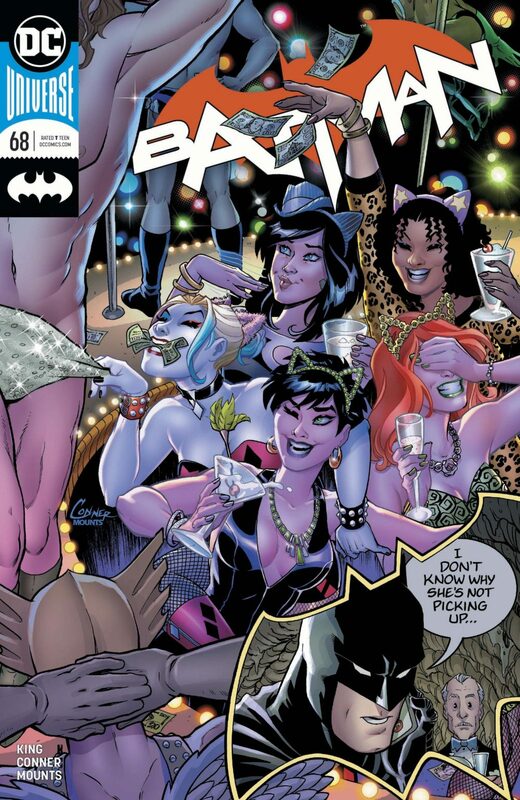 Like I said, Tom King wrote the bachelorette party with the same sensibility Amanda Conner and Jimmy Palmiotti bring to their own work. Those parts are so good, it makes me wish that the wedding had gone through. 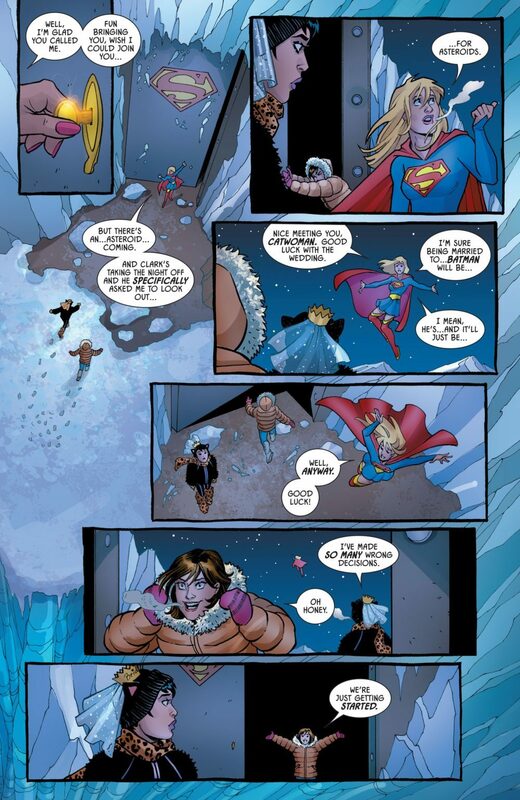 I’ve been lax in my DC reading the past couple of years, but Lois, while fun, seems a little out of character. While the story is enjoyable, it’s a little confusing. Almost everyone knows that the wedding was called off. Just picking this issue up without the solicitation, I’d be inclined to believe that there was a reconciliation. Given that this is supposed to be a dream, there’s no indication of that otherwise unless I’ve read the first five parts of this story. Confusion isn’t good, and it doesn’t leave me wanting to read the rest of this, much less seek out the rest of the chapters. It’s not until the story is almost over that there’s any indication it’s a dream. Even then, the indication is that there might have been a reconciliation. The artwork is really good, even after it switches away from Amanda Conner. 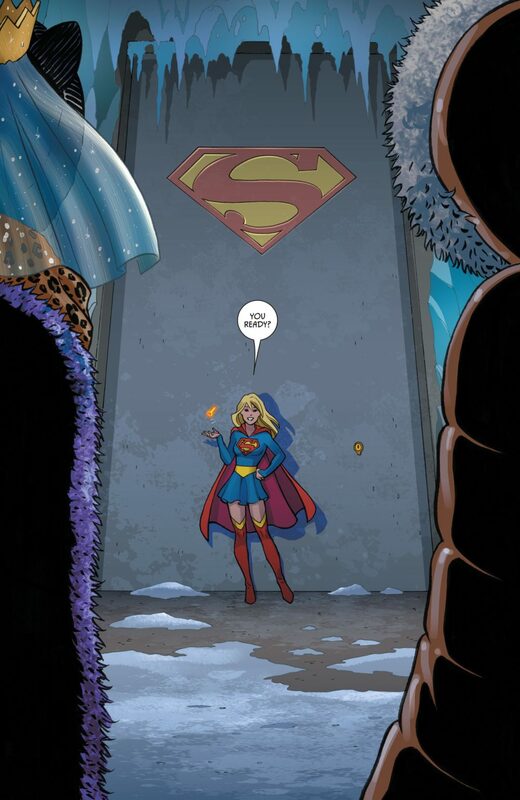 I really like the sense of Superman’s fortress being a trophy room. 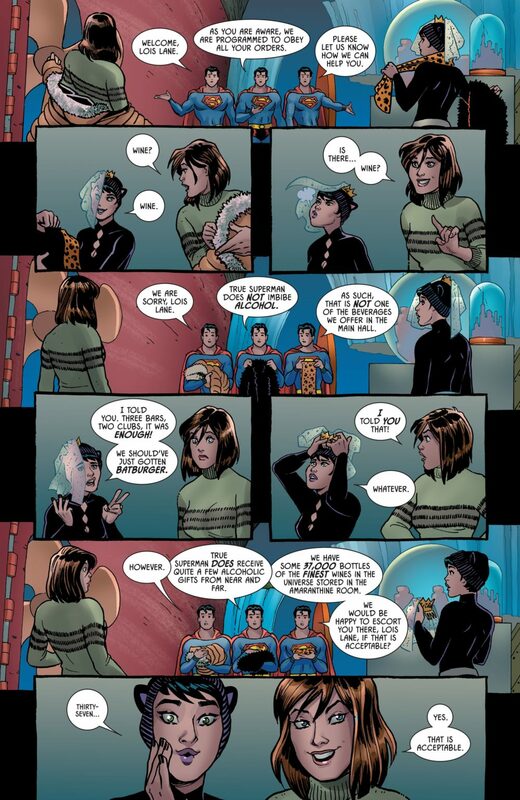 The Superman androids being strippers for Lois and Catwoman are a nice touch and Amanda Conner, like the pro she is, makes them identical. The only glitch comes with Catwoman’s Superman costume changing sleeves at least twice. The change in art styles is a sudden difference that is a little jarring. I really dislike when comics switch artists without an obvious reason for it. 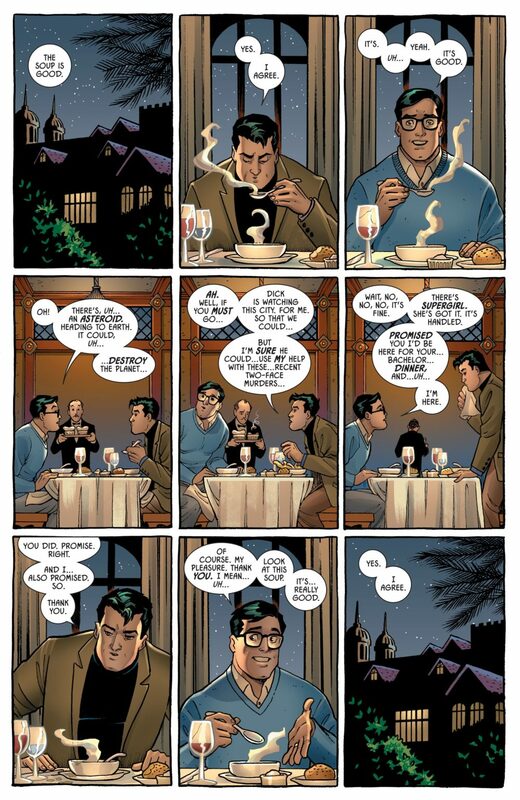 I think it might be Batman’s mind coming to terms with it being a dream, but like I said, the dialogue leads a casual reader to think that there was a reconciliation. The confusion I was in bothers me. What also bothers me is that this is almost the Batman story that we need. Instead, we get the cliche of a dark and brooding Batman. I want once in a while to see a little fun in my Dark Knight Detective.